Born in Worcester, England, he was educated at the Worcester Royal Grammar School, University College (Reading), the University of London, and the University of Manitoba. He taught for some years at the Tamworth Grammar School in England then, in 1921 he joined St. John’s College in Winnipeg, where he served as registrar and as lecturer in chemistry from 1928 to 1940. 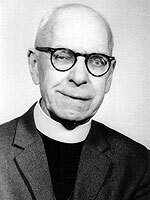 He was ordained a priest in 1937 and served parishes in Alberta and Winnipeg. From 1947 to 1960 he was provincial archivist of the Ecclesiastical Diocese of Rupert’s Land. He wrote many works of church history, including The Anglican Church from the Bay to the Rockies, From the Bay to the Rockies and These Men Went Out. He wrote “An Anglican Viewpoint” for the Winnipeg Free Press. In 1970, he was awarded a Manitoba Centennial Medal by the Manitoba Historical Society. He died at Selkirk, Manitoba on 1 December 1979. There are extensive papers at the Rupert’s Land Archives. Obituary, Winnipeg Free Press, 3 December 1979.